↑ ၁.၀ ၁.၁ ၁.၂ ၁.၃ ၁.၄ "Polio vaccines: WHO position paper, January 2014." (Feb 28, 2014). Wkly Epidemiol Rec 89 (9): 73–92. PMID 24707513. ↑ Aylward RB (2006). 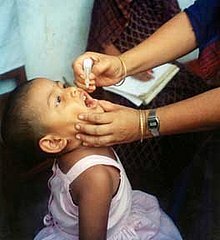 "Eradicating polio: today's challenges and tomorrow's legacy". Annals of Tropical Medicine and Parasitology 100 (5–6): 401–13. doi:10.1179/136485906X97354. PMID 16899145. ↑ "Pioneering figures in medicine: Albert Bruce Sabin--inventor of the oral polio vaccine." (2005). The Kurume medical journal 52 (3): 111–6. doi:10.2739/kurumemedj.52.111. PMID 16422178.